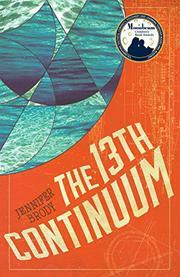 A teenager discovers something very wrong in her post-apocalyptic deep-sea colony. One thousand years after the Doom (an event caused by a generic doomsday device that rendered the surface of the Earth uninhabitable for centuries), Myra is a newly minted engineer in the undersea colony, the prehistory of which is explained in early, pre-Doom chapters. She’s the youngest engineer, having been forced out of school for a blasphemous offense that could have netted her death—early in the colony’s history, a domineering cult swept into power, erased history, and instituted an implausibly rigid class structure to facilitate regulation of the limited resources on hand. When Myra learns that the ancient machine keeping the colony alive is breaking down and can’t be repaired, she sneaks around to find the long-lost Beacon that will guide her to the surface. Meanwhile, another colony, the Second Continuum, lives on a large spaceship, where life centers on soldiers and fancy shape-shifting weapons, and it is heading back to Earth. (Its martial culture baffles, as there’s no indication they’ve fought any battles other than practice in the past few hundred years.) While the idea of these parallel societies’ diverging developments has potential, the credibility-breaking broad strokes with which they are painted result in a cartoonishness that undermines the story’s seriousness and stakes. A love-at-first-sight romantic storyline does no favors, nor does the typical sequel setup ending.